Just hundred yards away from the site where the majority of the planning committee approved the skyscrapers proposal for the Ram Brewery site in December 2008 (called in by the Secretary of State and subject of a Public Inquiry last November), a scheme including a 21 storey-tower was approved last week. Similar arguments against high density, size and increased pressure on public transport in an already congested location. More than 100 objections. Same story also as Labour councillors Belton and Randall opposed the scheme, which resulted in a split vote 6/2 in favour on January 7th 2010. The planning application 2009/3017 (Enterprise Way – Osiers Industrial Estate) is described as demolition of existing buildings an erection of 8 buildings ranging in height from 2 to 21 storeys comprising 275 flats of which 89 would be affordable; 3,587sq.m. of commercial floor space to include shops, financial and professional services, restaurant, food and drinking uses, office , health and leisure uses. Basement car parking provided for 165 vehicles with vehicle access onto Enterprise Way. Provision of landscaping and ecological enhancements, including new surfacing to Enterprise Way and Wandle Riverside area. The Planning report that I will refer to below is available HERE (pdf). In the immediate proximity (Wandsworth Riverside Quarter) 204 flats have been built and an additional 504 residential units are proposed (of which 187 would be “affordable”). As a reminder, the Ram Brewery development, also approved by Wandsworth Council is proposing 1000 new apartments. The quantum of affordable housing represents 32% of the overall units and it is said that any increase of contribution or affordable housing would render the scheme un-viable. The GLA highlight that considering the lack of information regarding residential quality and amenity, the proposal cannot be considered acceptable at this stage. Although they do not criticize the design, they highlight that the ground floor proposal does not comply with London Plan Policy and ask the Council to consider the impact on the immediate local and wider context. Regarding transport, it is considered that there is a convenient access to local amenities with Wandsworth Town Station a 600m walk and close to East Putney Underground station and bus roads with existing spare capacity according to TfL. 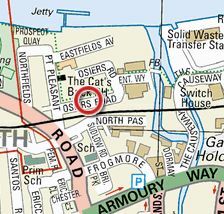 However (as also highlighted in the Ram Brewery scheme), Wandsworth Town station operates in excess of 116% but the development is said not to create any significant worsening (although if you add all the current plannings you can seriously wonder if any consideration was given to the long term issue). The developers have calculated their contribution to the public realm under section 106 to £1.4m which raises questions due to its very low level (in comparison, for example, with the £41m proposed for the Ram Brewery scheme). The Wandsworth NHS has requested an additional contribution of £1.2m which the developers have dismissed. The planning officer recommended an overall contribution for a total of £2.3m. I counted 106 objections (not 72 as in the report). Considering the area, mostly consisting of unused (but listed) buildings, industries and commercial units, along with the 8-storey Council offices, it is not surprising that the level of representations would be different from an area such as Clapham Junction, located at the heart of a thriving important area of Victorian and Edwardian houses (similar level of presentations as for the Ram Brewery development and same comment). However more than 100 objections and no support at all should be addressed effectively by the Council. Objections say that the development is too dense and out of character and proportion with the surrounding, Wandsworth park is already over-used and proposed improvements not significant in respect to the size of the development, that the number of car parking is insufficient and that Wandsworth Town Station is already overcrowded. Councillor Maddan (Conservatives) also objected and underlined several inaccuracies (such as saying that there is a boat service, assuming rail plans while not committed, reference to the Bolingbroke hospital while the site is closed…). The Wandsworth Society said that the proposal to change the use of the site from industrial employment to mix-use residential/commercial has yet to be approved. The density (864hrph) is about twice the one recommended by the London plan (300-650hrph) for site as this with PTAL2 (Public Transport Accessibility Level). The planning officer, talking about density, confirmed that the proposed schemed is in considerable excess of both the urban and central setting (page 53 of the report). The development includes also a tower several stories higher than any other buildings built or planned between the River Wandle or Wandsworth Park. Applications for buildings of more than 12 18 storeys will generally be unacceptable, and will only be considered in exceptional circumstances. The 21-storey tower challenges the policy framework for the redevelopment here as did the 15-storey WRQ Phase III proposal in 2007. With this aspect of the scheme the judgement for the Committee is whether the benefits the scheme will bring for the regeneration, townscape and public realm justify its inclusion in the proposals. Entry filed under: Wandsworth Town. Last Thursday evening, whilst most people were dealing with the weather or overcoming the effects of their holiday, the Wandsworth planning committee met and approved a scheme for Osiers Road consisting of 9- 21 storey high residential blocks at the mouth of the Wandle River. This scheme was approved in a split vote (6 conservatives in favour and 2 labour cllrs against). Local opposition was quite strong which pointed out the proposal densities (similiar to Rams Brewery) were totally inappropriate to an area that is not well connected to the public transport network. Should this be another proposal that needs to be called-in by the Secretary of State? Gary Pemberton> The scheme might be too small to be called in by the Secretary of State, especially when you consider that we are still waiting for the result of the public inquiry for the Ram Brewery which already took a lot of efforts. 2. It raises significant architectural and urban issues. The frustration of the planning acts is that any appeal process following a local planning committee decision can only be made by the applicant and not the objectors. This is gives very limited recourse for local people to respond to such outrageous decisions such as the approval for Barratt’s Osiers Road scheme. Whilst the Mayor’s office can refuse the decision, it is quite unlikely which again leaves the only option to overturn a planning decision to the Secretary of State to call in the application, which interesting was previously done on an adjacent site when a 17 storey tower was turned down. I know it may be a hopeful thinking to get the scheme call-in, but when one is confronted by the planning committee’s blatent disregard of local people’s views and their blind eye toward their own planning policies and guidelines, there is little other option but to pursue action against this inexcusible decision by other means.